Hopefully all of your Holiday cards are in the mail, but if didn't get Christmas cards out to everyone there is still time to create New Years cards to send! Today we are sharing this super fun card by Jess! She used our lovely snowflakes from the Beautiful Blizzard stamp set embossed in gold. I love the fun watercolor background she created too. 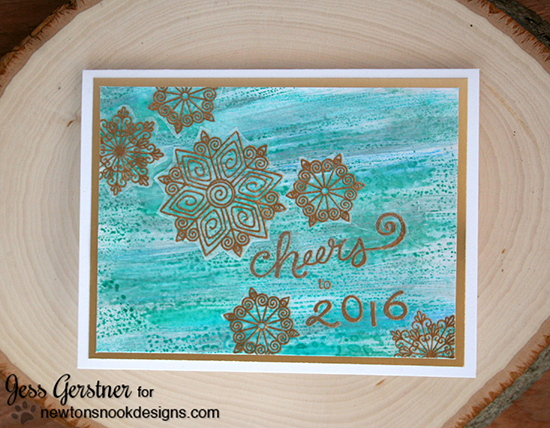 The sentiment "Cheers to 2016" is from the Years of Cheers stamp set! This set is super cool because it has all the numbers individually so you can pick and choose them to customize your year. This is also perfect for anniversary cards too! Thanks for the awesome card today, Jess! You can see more of her projects on her blog, Jess Crafts - and you can also follow her Jess Crafts youtube channel to see more fun videos! Such a pretty New Years card...the blues/gold is a lovely combination! This is such a stunning design! :) Thanks for sharing the video and stopping in to wish you all a Merry Christmas and a wonderful New Year! So pretty! I'd like to wish a Merry Christmas and amazing New Year to Jen, Jeff and all DT members!!! Hope to see more of your wonderful stamps and dies in 2016!! !